Business presentations have been given a new lease of life with the use of computers. Presentations no longer simply consist of powerpoint slides but include video, audio and interactive meetings. Sophisticated computer software and hardware has taken business presentations to a whole new level. Business audiences are no longer happy with simple spoken presentations with a few powerpoint slides thrown in. They now expect a mix of exciting visuals, music and online interaction if available. If audiences are not provided with these effects during a presentation then it will usually not make much of an impact. Using computers will enable presenters to get their message across easier and reach a wider audience. There are many software packages available specifically designed for business presentations. They will help take the hard work out of preparing material such as flow charts, animation, diagrams and other visuals. Most computers will come with their own presentation software pre installed, but professional presenters will usually have their own preferred software packages. Many presentation tools can be downloaded free from the internet but they may not be to the level of sophistication required. To find the right software to suit your presentation needs you can download free trials and decide if these packages will be useful. Software applications may be dependant on the type of computer and operating system (OS) you have. Some Macs can utilise Windows packages but this is mainly the latest Mac operating systems. Enhanced graphics including 3D and animation. Ability to input video into a presentation. Recording of presentations straight to computer memory for later viewing. The presentation can be viewed online for offsite staff members. Video conferencing can allow offsite staff to interact and ask questions while watching. Online facilities mean that staff in offices in different countries can watch the presentation. Presentations such as sales conferences, meetings, lectures and staff training can all utilise this technology. Staff can view presentations online without leaving their office desks. Business presentations can be created and presented entirely via computer technology. There is now no need to hire presentation venues with today’s online technology. The entire process of a business presentation can be simply created using computer software and then shown using online technology with interaction by the audience. Web conferencing and video conferencing has made this process a simple and cost effective business tool. 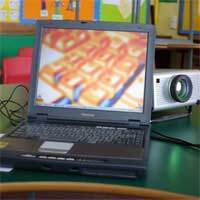 Computer technology has now become so advanced that business presentations can be recorded for viewing as needed. Presentations can be stored as video computer files and then viewed either on the actual PC or transferred to portable video players that utilise digital video files. This technology is developing at such a rate that it is now possible to transfer and view videos on compatible mobile phones. With wireless networks the computer hardware does not actually need to be in the same room as the presentation. All that is actually be needed in the presentation room is a screen with WiFi capabilities and then the presentation can be started remotely from another room. With WiFi technology there is no need for messy cables or the presenter running back and forth to stop and start the computer. Business presentations can be greatly enhanced by computers and software applications. This technology is continually developing and is very user friendly. The least technically minded person will now find this technology easy to use. Businesses should find that staff and customers will be more receptive to presentations that utilise computer technology.